This month our rider interview comes from Luke Davies, Business Development Manager at Cardiff & Vale College. Luke took part in our 2016 Wales challenge and we’re pretty sure he’s taking part in our upcoming Derby challenge in early 2018. Here’s what he had to say about taking on Cyclone24. The College was invited to enter a team into the Cyclone24 challenge in Newport. It was a challenge I couldn’t turn down! Having not ridden on the track before, the challenge brought with it the opportunity to take my cycling to a new environment, one that is very respected among cyclists, especially being Welsh! It goes without saying, Cyclone24 really inspired me. It was the chance to share in this unusual sporting feat with colleagues, and many other riders, all for a great cause! I ride on the road as a hobby and enjoy training in the gym. I kept up this regime and put in a few interval spin sessions to target the track. I certainly didn’t practise anything for 24 hours though. Thankfully the adrenaline and support gets you through that part. The thrill of zooming down the bank as you completed loops of the track in a group of riders, participating alongside ex-Welsh rugby internationals, the respect for my team mates some of who were non-cyclists, and above all, the camaraderie of all teams. For the last 6 hours, we split into 2 x 3 hour shifts. I remember not falling asleep in my supposed 3 hour ‘break’ but I didn’t worry about that. The adrenaline was still pumping and the carbs were aplenty having an endless supply of power bars. It wasn’t all plain sailing, and with 2 other riders to share 3 hours, we were covering longer shifts on the track. With every lap we were getting closer so that kept me going. The leader board also added the competitiveness needed to get to the 24th hour! Pace yourself, especially if you’re not used to riding fixed gear bikes on a track. Take the opportunity to have a massage if possible, it really helps to keep the cramp at bay! Finally, visit the track a couple of times before the big day – the experience will settle any nerves. Last month Luke embarked on another challenge, one of very personal nature. 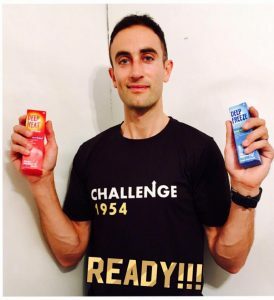 Challenge 1954, a challenge Luke created to support his father’s battle against cancer. Luke’s father was born in 1954, which gave him the idea for this endurance challenge. 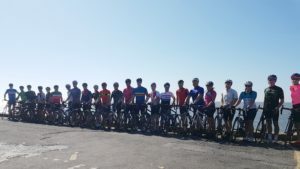 Activities included a 170km bike ride around the Vale of Glamorgan, a 40km hike, 20km row and over 500 burpees and pull-ups.